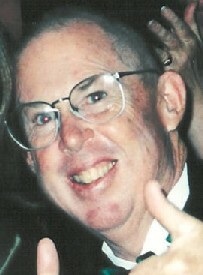 MCCARTHY, Daniel John - Passed away on Friday, May 2, 2003 at his home in San Rafael in the arms of his loving wife, Elaine. He was 58. He will be sorely missed by his wife, daughters Michelle McCarthy of San Francisco, Christine Rimer of San Carlos and son-in-law Christopher Rimer. He leaves behind many loving nieces, nephews, cousins and friends. A 4th generation native San Franciscan, Dan attended St. Ignatius High School and University of San Francisco. He proudly served as a Captain in the Vietnam War. Upon his return, he received his Jurist Doctorate from San Francisco Law School. Dan retired from Pacific Bell after 30 years of service as a regulatory attorney. He served his community on the President's Advisory Council at the Jesuit School of Theology at Berkeley, and on the Boards of the San Francisco YMCA and Marin Catholic High School. It was Dan's sense of humor, his smiling Irish eyes and love of life that brought joy and laughter wherever he went. Even in death, people smile remembering all the wonderful moments shared with him. His profound sense of faith was an inspiration to all whose lives he touched. He was currently studying as a Provisional of the Knights of Malta. 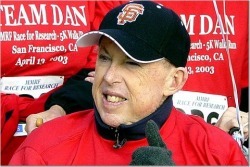 Family and friends are invited to remember and celebrate Dan's life at his Funeral Mass to be held on Thursday, May 8th at 10am at St Raphael's Church at 1104 Fifth Avenue in San Rafael. A Vigil and Rosary will be held Wednesday evening, May 7th at 7pm also at St. Raphael's Church. In lieu of flowers, Dan would like donations to be made to Abbey of New Clairvaux, Sacred Stones Project, P.O. Box 80, Vina, CA 96092 or Jesuit School of Theology at Berkeley, 1735 Le Roy Avenue, Berkeley, CA 94709. I’d like to leave an afterglow of smiles when day is gone. Of happy times, and laughing times, and bright and sunny days. As you know, my dad’s been sick for a while. So unfortunately, I’ve had a chance to think about this moment for a while. What could I possibly say to pay tribute to my dad? What story could I tell, what picture could I paint that would begin to honor my dad’s life and reflect what it was about him that brought so many people here today. Upon reflection, the most vivid image of him immediately popped into my head. It was my dad, dressed in African tribal gear acting out Neil Diamond’s Brother Love on Thanksgiving night - 1998. My first thought was “Well, that certainly won’t do.” I mean, telling a story of my dad dressed, as Brother Love is hardly funeral material. It’s not serious enough. It’s not spiritual enough. And it’s certainly not meaningful enough. However, try, as I might, I simply could not see past this image. After multiple failed attempts to come up with a seemingly more “appropriate” theme, I decided to explore this ridiculous image a bit further, and after a few moments, I realized it wasn’t so inappropriate after all. In fact, it embodied many of the most valued and cherished aspects of my dad. So, for the few hundred people who weren’t there to experience Brother Love first-hand, let me fill you in. Thanksgivings at the McCarthy house has been known to get a bit raucous. The night starts out normal enough with cocktails, a big Turkey dinner and kids doing the dishes. A number of years ago, to make it interesting, the kids began singing during dishes… mostly church songs that of we all knew from years of Catholic schools. And then somewhere along the way, the singing evolved into dancing and the church songs evolved into a variety of sing-a-longs. The living room furniture is pulled aside and a McCarthy-style party really begins. This one particular Thanksgiving, Neil Diamond’s greatest hits had the prime seat in the CD changer. There we were, singing, actually no, yelling, along to the classics. Somewhere between “Sweet Caroline” and “Coming to America”, the song “Brother Love” came on. This is the one with no shortage of Hallelujahs. And as we danced and sang, dad must have had a twinkle in his eye when he had an idea and snuck out of the room. I imagine most of you have been to my parent’s house at least once if not many times. And one of the wonderful things about their house is the many pieces of furniture, artwork, and memorabilia they’ve brought back from their many adventurous travels. One of those special pieces hung proudly on the dining room wall. It was a very large, tribal gown or shirt, complete with sparkles brought back from our trip to 1997 trip to Africa. Well, that Thanksgiving night, dad seemed to think that this tribal gear was better worn than hanging on the wall. And so he re-entered the living room, transformed into Brother Love. And for the duration of that Neil Diamond song, dad was the center of the circle, acting out the part of Brother Love with hands either raised above him in praise or extended in front of him very dramatically healing those he touched. In his oversized tribal dress, he was larger than life. He lit up the room as he sang and danced and made us laugh until we were ready to collapse. For the length of that song, and I think a few songs thereafter, dad was Brother Love. So, this was the image I could not get out of my head. And while the story is silly, I realized there are so many things about this story that tell the story of Dan. First and foremost, it demonstrates his capacity to absolutely light a room. His personality was full of life, his smile was contagious and his humor was unmistakable. His smile, laughter and humor are mentioned in nearly every card, note or phone call we’ve received. In fact, immediately after my dad died, a friend came to visit. When he saw my dad, he smiled first and then began to cry. My mom has repeatedly commented that this is one of my dad’s best gifts, his ability to make people smile. Secondly, the Brother Love story took place during one of the most family oriented holidays of Thanksgiving. Family was very important to my dad. He loved his immediate family very much, my mom, my sister and I. But his love extended well beyond the immediate family, as he loved his nieces, his nephews, and his cousins so much. However, Thanksgiving at the McCarthy household also demonstrates the blurred line my dad had between family and friends. Be it individual, couples or families, friendship was such an important part of my dad’s life. And so it was appropriate that Brother Love be experienced first-hand by friends and family. Finally, as I mentioned, my dad as Brother Love raised his hands in praise and extended his hands to heal those around. Yes, this was done in fun and jest with lots of drama. However, take away the costume and joking aside, my dad really did have the gift to heal. I can think of multiple people here in this Church who are better people, healthier people, happier people, for having known Dan. And it’s not just “know” him, it’s having had him reach out to them when they were having a tough time, be it sad or angry or sick and through his faith and his hope and his love, I know of many people who are better because of him. What a gift! And the source of this gift was his Faith. A few weeks back, during a small family Mass my cousin John said in our living room, my dad shared his thoughts. He spoke of Faith as the foundation that bonds us. He said that Faith was stronger than the bond of blood or friendship. He said that from Faith came Hope. And from Hope comes Love. For so many, sickness challenges their Faith. For my dad, it was the opposite. In his sickness his Faith was so stronger than ever. And built on his Faith was his Hope and his Love. So these were my thoughts when I realized the story of Brother Love wasn’t so inappropriate after all. It demonstrated his ability to light up a room, his contagious laugh, the important and family and friends and his ability to heal. He gave generously and he had a lot to give. And thus, I’d like to share a gift he gave my mom, my sister, my husband and I less than 1 week before he died. He pulled each of us aside and said while he still hoped for a miracle, he was at peace with his situation. He was at peace with himself and with God. He gave us this gift first-hand and I know he’d want us to pass his words on to you so you too can heal. So whether you call him Dan, Danny, Daniel, Uncle Dan, McCarthy, Mr. McCarthy, McFilth, the Bishop, Brother Love, Dad, Pops or Sparky, you are better for having known him. So you can fill in the name, but Pops, we’re glad you’re at peace, we’ll miss you tremendously and, if you have a moment, check in on us from time to time.